the collective name of the largest school of Jōdo Shinshū Buddhism (which further sub-divides into the Nishi and Higashi branches). 'Hongan-ji' may also refer to any one of several actual temple buildings associated with the sect. 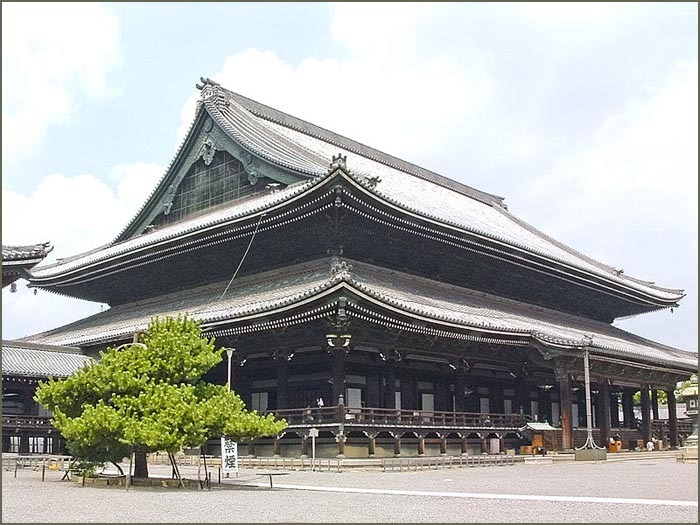 The Hongan-ji was established as a temple in 1321, on the site of the Otani Mausoleum, where Shinran, the founder of the Jōdo Shinshū (True Pure Land) sect was buried. The mausoleum was attended by Shinran's grandson (through daughter Kakushinni), Kakue. Kakue's own son, Kakunyo, became the first chief priest of the Hongan-ji and 3rd Monshu, and dedicated it to the worship of Amida Buddha. 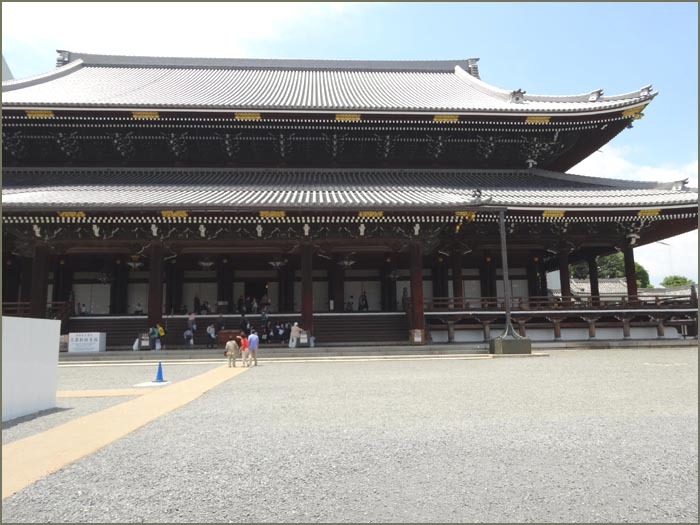 The Hongan-ji first gained power and importance in the 15th century, when Rennyo became its eighth chief priest, or Monshu. However, the Tendai sect, based on Mount Hiei, saw this expansion as a threat and attacked the Hongan-ji three times with their army of warrior monks. Rennyo fled to Yoshizaki, where he established a new temple compound. During the Sengoku period, fearing the power of the monks of the Hongan-ji, Oda Nobunaga tried to destroy it. For ten years, he laid siege to the Ishiyama Hongan-ji in Osaka, one of the two primary temple fortresses of the sect. Western Temple of the Primal Vow, often called Nishi Honganji (西本願寺).
. Namu Amida Butsu 南無阿弥陀仏 The Amida Prayer. 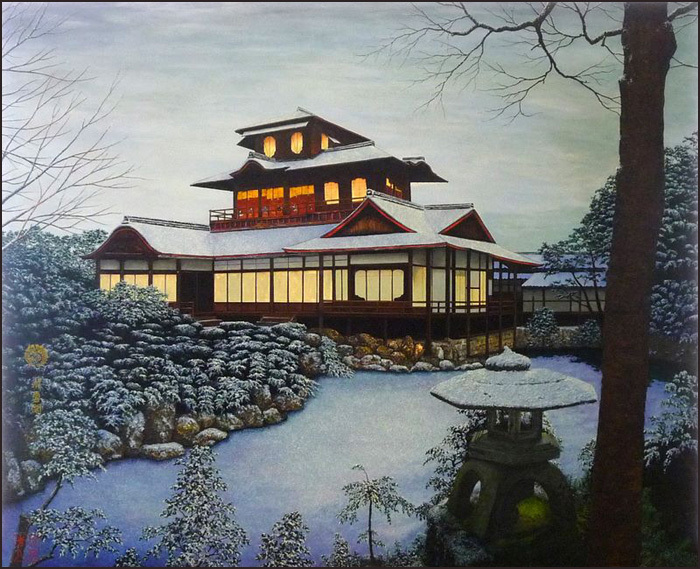 a large tea pavilion, containing four Noh stages, one of which is thought to be the oldest in existence and the other being the largest outdoor Noh stage, and the Kokei no Niwa (虎渓の庭) garden. Unique, three-storied timber building, roukaku 楼閣, built in asymmetrical design and located on the grounds of Nishihonganji 西本願寺 in Kyoto. Traditionally, it was believed to have belonged to Jurakudai 聚楽第 (built between 1584-86) for pleasure and entertainment, according to the wishes of Toyotomi Hideyoshi 豊臣秀吉 (1536-98), and transferred to Nishihonganji (c.1619). However, at present, many scholars think it more probable that Hiunkaku was built at about the same time the garden, Tekisuien 滴翠園, between 1624-44. It is situated in the southeast corner of the temple precinct and faces a pond called Sourouike 滄浪池 Soro-Ike (blue wave pond). A boat can carry visitors across the pond and anchor beneath the first story of the building. Steps are provided to climb up to the first floor. There is an undulating gable roof over the boat entrance and the water can be seen from the open translucent sliding screens shouji 障子. Another access to the Hiunkaku is over a long stone slab bridge. Its length on the north & south sides of the bridge is 25.8m, the east side is 11.8m and the west, 12.5m. The first story interior is in the shoin style shoin-zukuri 書院造, with the study facing the pond. The study has two levels of floor space, of which the higher level has three mats. The study is called the Shoukenden 招賢殿 (invitation to wisdom hall) and has 7 1/2 mats with 2 1/2 mats in the alcove. Next to the study is the Hakkei-no-ma 八景の間 (a room of eight scenes), a veranda, and a tea ceremony room called Ikujaku 憶昔 (recalling old times). The second story has a Kasen-no-ma 歌仙の間 (room of great poets), named after The Thirty-six Immortal Poets Sanjuurokkasen 三十六歌仙 painted on the wooden doors and walls. It also has a raised and lower level floor. There is a lightly railed veranda around the second story. The third story, excluding a stair landing, is only eight mats in size. Katoumado 火灯窓 (ogee shaped windows) are on the north and east sides. 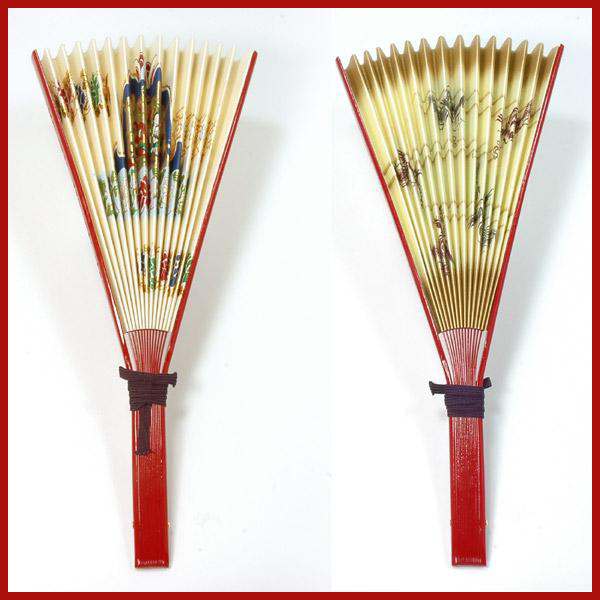 Shouji with diamond-shaped latticework are covered with translucent paper. The paneled ceiling has paper pasted and gold leaf pressed on it. All the building's roofs are shingled kokerabuki 柿葺. The first story roof has an undulating gable karahafu 唐破風, on one side, and on the opposite, northwest side, a hip-and-gable arrangement irimoya-zukuri 入母屋造. The second story has a convex hip-and-gable roof with undulating bargeboards on three sides. The third story has a pyramidal roof hougyou-zukuri 宝形造. kaku 閣 2-storied structure in a garden. Something that is more splendid and elegant than an arbor or a simple pavilion.
. Kakunyo Ki 覚如忌 Memorial Day for Saint Kakunyo . He was the first chief priest of the Temple Hongan-ji, Kyoto.
. Shinran Ki 親鸞忌 Memorial Day for Saint Shinran . Otorikoshi 御取越　（おとりこし） "Passing into the New Year"
November 22 till 28. 28 is the death memorial day.
. Kubutsu Ki 句仏忌 Kubutsu Memorial Day . Priest at Higashi Honganji, Kyoto. Haiku poet.
. Rennyo Ki 蓮如忌　Rennyo Memorial Day . was the 8th Monshu　門主, or head-priest, of the Honganji Temple of the Jōdo Shinshū sect of Buddhism, and descendant of founder Shinran. Jodo Shinshu Buddhists often referred to as the restorer of the sect (Chūkō no so (中興の祖) in Japanese). He was also known as Shinshō-in (信証院), and posthumously Etō Daishi (慧灯大師). Many shine in brilliant silver and gold color coating. It is not used to fan for fresh air, but sometimes hit to make a sound. Sometimes it can be opened and a rosary or sutra book placed on it during ceremonies when sitting on Tatami mats. This fan can also be placed in the collar when both hands are needed. Saint Shinran spent some time in exile in Echigo. On the way, when Shinran had to go to exile in Echigo in 1207, there was this pine where he sat down to rest, along the "beach road" 浜街道. There was a whole pine grove at the time of Sain Shinran. The tree is maybe 500 years old. When Issa composed this haiku, early in Ninth Month of 1822, he was paying visits to some of his haiku students in Naganuma, a village in his home province of Shinano, present-day Nagano Prefecture--and so the poem must be either a memory or a pure invention. In fact, in his journal he prefaces it with the head-note, "Spring"-- underscoring the fact that this haiku, composed in autumn, doesn't pretend to depict a scene that the poet could have witnessed at the time. He could be referring, then, to either one of the Kyoto temples or to a Honganji of Edo (today's Tokyo), where he spent much of his young adult life. There are at least four Hongan temples: two in Kyoto (Higashi Honganji and Nishi Honganji) and two in Tokyo (Higashi Honganji and Nishi Honganji). 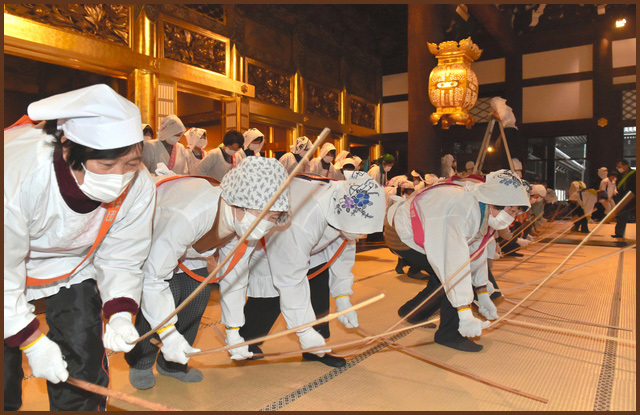 It is customary for the Monto　門徒 of Hongan-Ji to come for the Year-end cleaning, whipping all the tatami to get the dust out. This important event is usually featured in the TV news.
. sae kaeru 冴返る cold comes back .